The tortillas for your tacos don’t come out of a plastic bag anymore. We have grown out of our Taco-Tuesday phase and expect more, much more, from even something as humble as a corn tortilla. Have you noticed the kitchens in Mexican restaurants these days? Most employ a tortilla maker back there now, making them from scratch — Play-Doh-like masa, balled up, pancaked and tossed onto a griddle to sizzle. They bloom, fragrant with corn. Those rubbery stacks sold in grocery aisles? Filled with so many artificial preservatives, those tortillas could have eternal life. They’re bland, a mere workhorse to transport the carnitas to the mouth. When served as tacos, they’re the equivalent of eating cardboard pizza. But when fresh, corn tortillas impart flavor and terroir. You can’t have great tacos with mediocre tortillas. Once, few restaurants — Rosita’s and Fogón Cocina Mexicana, for instance — made their own. Now, it’s expected. Asadero Ballard, arguably the most successful Mexican restaurant to debut in Seattle last year, makes its own. The owner is so convinced that it’s a game changer, his kitchen will soon make flour tortillas as well. This year, the two big Mexican openings, Zocálo in Pioneer Square and Pablo y Pablo near Gas Works Park, both boast tacos with handmade tortillas. Seattle’s most celebrated chef, Tom Douglas, takes it further, importing heirloom corn from Mexico to make his, grinding the kernels at 8 a.m. every day in a lava stone grinder at Cantina Leña. The fresh tortillas are so integral to Cantina Leña’s operation that Douglas put an image of his tortilla maker Maria Orea on the menu. Cantina Leña and Gracia in Ballard use organic maize from the Masienda brand, the gold standard in the U.S. Only 54 restaurants in the country shell out the big bucks to buy Masienda kernels to make tortillas. But for all that progress on the restaurant front, it’s still tough to find good tortillas in stores. Many resemble industrial-strength wash cloths; others are flimsy. None seem as good as Three Sisters Nixtamal tortillas in Portland. Chef Gabriel Chavez shares my misery. Before he opened his acclaimed namesake restaurant on Capitol Hill, Chavez searched all across Western Washington to source his tortillas. His tiny kitchen didn’t afford him the space to make them himself. He discovered Casa El Dorado, a restaurant/tortilla factory in an Everett strip mall. Short of making them yourself, he’s convinced these are the best you can buy over the counter. Chavez sprinkled a warm tortilla with salt and rolled it like a cigar to munch on while chatting. “This reminds me of home,” said the native from Durango, Mexico. “It tastes fresh of corn. Doesn’t taste limey.” Lime is often used as a natural preservative. Chavez warned me the line would be long on weekends, since many Mexican families across Western Washington go there. I drove up Thursday morning instead. By 11 a.m., a dozen customers had already bought bags of fresh tortillas and chips. They’re dirt cheap, a kilo (about 28-30 tortillas) for $2.50. The brothers who own the tortilla factory declined to comment, saying they didn’t want their competitors to know their trade secrets. Their tortillas are made fresh every day at 8 a.m. Through the counter window, you can see the masa dough churning, and the tortillas spitting off the conveyor belt, with a woman sitting at the end to catch and stack them for sale. It’s worth the drive north if you want to up your taco game at home. They tasted even better when I pan-fried them in lard. While thin, they don’t flake easily. But for the best corn tortillas, check out the handmade versions served at the restaurants below. This cocktail den in Pioneer Square aims higher gastronomically than your usual wing-and-slider dive. 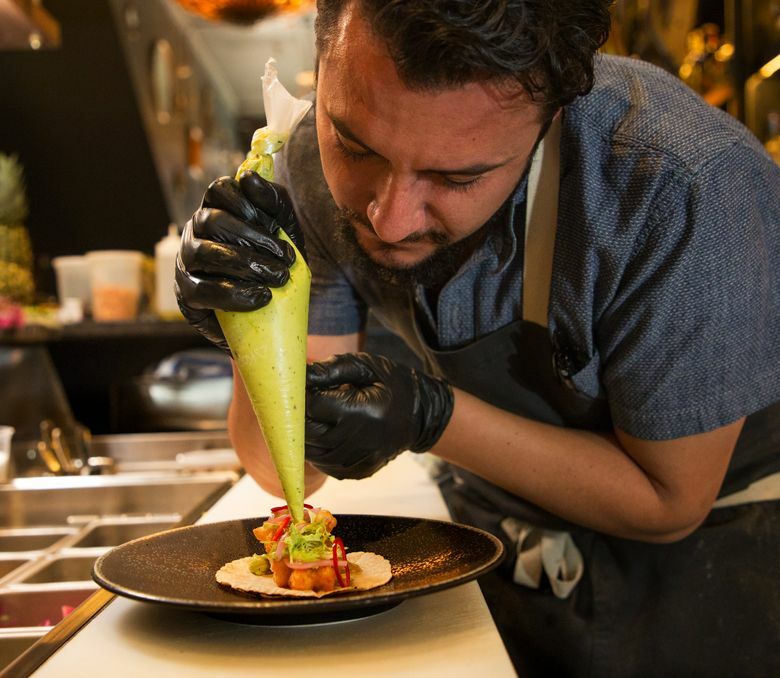 The focus is on South American cuisine at night, but come lunchtime, chefs Tanner Smith and Felipe Prieto are all about the tacos. For an umami punch, the chefs dehydrate and grind shiitake mushrooms to add to ground peppers and masa flour to form these tawny discs. Fast-casual it’s not. Each tortilla is made to order, each taco studiously plated in techno colors. With the chorizo taco, the Mexican sausage and cotija are both made in house. 114 First Ave. S., Seattle; deadlineseattle.com; note that tacos are served only on Tuesday-Friday from noon-4 p.m. The tortillas impart a nutty, corn flavor. They’re thin but pliable. 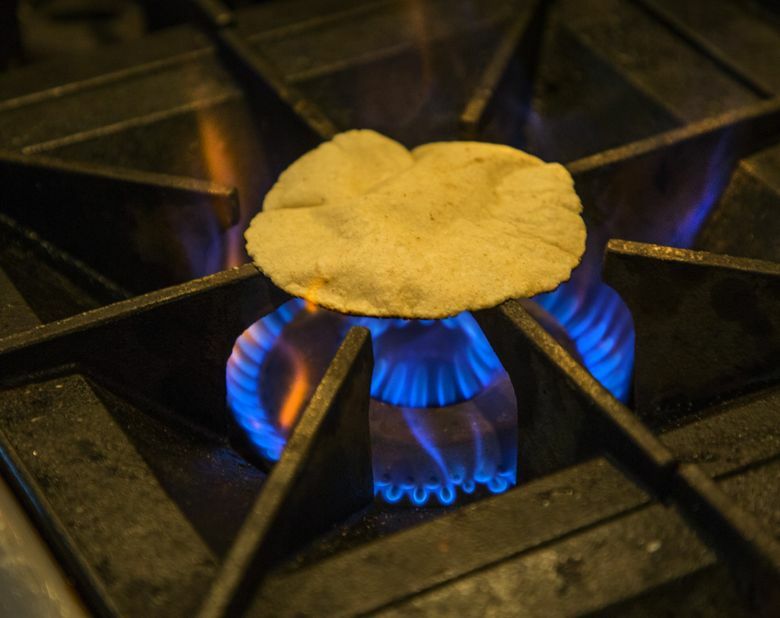 When warm, they’re so moist they almost melt in your mouth, the best corn tortillas in Seattle. They’re so good that you can just munch on them with hot sauce, though you should get them as a beef or pork taco with a side of “street corn” instead of the beans. The better deal is the naked tacos (three for $10.99), served with the tips, ends and leftover wagyu-grade cuts. Don’t be seduced by the free salsa bar. A pinch of onions, cilantro and a few drops of hot sauce and lime will do. Those condiments shouldn’t upstage the mesquite smoked beef draped in fresh corn tortillas. The handmade tortillas here are so good, it’s almost a shame this taqueria is in Belltown, where the party-hardy set may be too drunk or high to appreciate them. Maybe the kitchen realizes that, too. They offer two versions. During happy hour, this taqueria hawks discount tacos made with store-bought tortillas topped with beef or chicken. Shell out the extra buck for the “regular taco” served on a warm, fluffy tortilla made by the woman in the left corner of the kitchen. Or order both and do a side-by-side comparison. Here’s the thing about handmade tortillas: Your taco will cost more. Someone has to pay for that labor. That’s why the best tacos are north of 3 bucks. The best handmade version I tasted in the $2 range is from this Beacon Hill spot, a favorite of my colleague Bethany Jean Clement. Here you’ll find the ideal proportion of tortilla to meat. The former Canlis sous chef, Jeffrey Hunter, heads the kitchen of this modern Mexican restaurant. The al pastor, chunks of pit-roasted pork shoulder, has a pronounced chipotle flavor that pairs well with ribbons of pickled pineapples. All the flavors — salty, sour, sweet and smoky — meshing in a taco. It’s a good lunch deal (3 for $13). This tortilla is good as a barbacoa (roasted lamb) taco. But it’s even better as a dessert. Get an order of fresh tortillas to go (four for $2). Heat them up at home, slather on some butter and honey, and roll them up to snack on. Heavenly.